September 1st, 1939 saw the start of the biggest and most concentrated mass movement of people in Britain's history. In the four days that followed the government announcement to "Evacuate forthwith", Operation Pied Piper saw nearly three million people transported from towns and cities in danger of enemy attack to places considered safer in the countryside. The majority were schoolchildren, labelled like luggage, carrying their belongings in a suitcase and their gasmask in a box, accompanied by about 100,000 teachers acting as guardians. 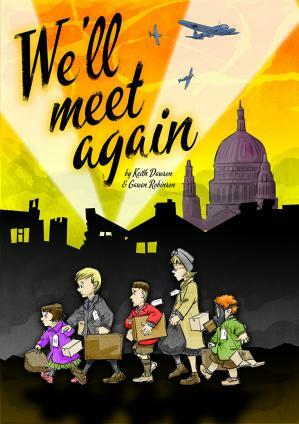 "We'll Meet Again" follows the exploits of a group of children as initially, they are being prepared at school, just before the outbreak of war, donning gas masks, hearing sirens and being instructed in the safety of the shelters. Following the famous speech by PM Chamberlain, declaring that "We are at war", we see the children at the railway station making their tearful farewells before going on the adventure of a lifetime into the unknown. All this of course, took place during what was known as the "phoney war", a time when many parents felt that the threat of bombing had been exaggerated. By early 1940, some sixty per cent of children had returned to their homes, something the government hadn't anticipated; after all, the evacuation was a voluntary scheme. In Act two, we meet the children back home, bored stiff. Then, as the bombs begin to fall, the decision is made that the children must once more be evacuated to somewhere safe. Finally, we jump forward to 1945 and the armistice. Children and parents are re-united once more as the show closes with the title song - "We'll Meet Again".